Praise the Lord. We had a great first session last night at The River of God Christian Fellowship at Bacoor, Cavite. There were 27 people present for training and they represented some 8 churches from that area. 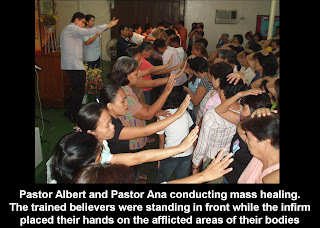 Since it was a Wednesday night, we were told that many people were invloved in their Bible Studies or Prayer Meetings. There were 10 pastors present and so it was an eye-opening session for them. They did not have the LCD projector and so I just taught directly from the Bible. They were visibly interested and for three hours, everybody was still listening attentively. During the demonstration, I asked those who had tangible pain to come forward. Five people came forward and everybody was watching to see what would happen. Then I asked if anyone would care to lay hands on the first man who was limping badly because of the athritis in his knees. Two young men jumped up in great faith. Later I found out that they were pastors who had been asking the Lord for empowerment in their ministries. Soon more people joined in and I asked the two young pastors, Grace and Bro Ong, (my father-in-law), to lay hands upon the knees of this old man. The first time, he had slight relief of the pain. I explained the way you did and told them that the mountain has moved slightly. I commanded but did not lay hands. All the hand-laying was done by the rest. The second time, the man could move his knees freely. On the third time, I asked one of the young pastors to give the command, and the rest laid their hands on the man's knees. 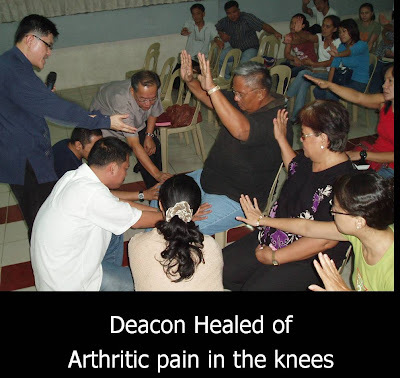 The miracle happened and in that instance, he was totally healed of the pain. He also had a frozen shoulder and this time, after about the fourth try, he still had the shadow of pain. However, it was not at the end of the service, while he was walking out to the door that I stopped him. I personally took authority over his frozen arm and immediately he was relieved and his pain gone. This man is a deacon from another church. His wife also had a frozen shoulder. 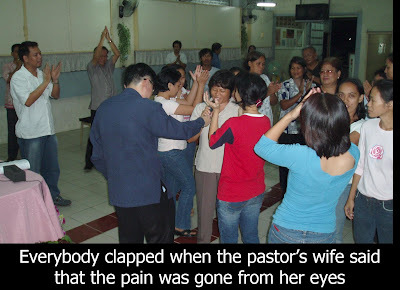 After about three times of commanding, the wife's shoulder was relieved of some pain. Then I told the people that I would use my firepower - my dear wife, Grace. I knew that Grace had tremendous faith in healing and so I leveraged upon that. She took over the command and with much authority ordered the frozen shoulder to be healed and the pain to go. I knew the pressure was upon her because of my sudden announcement that she was the my firepower. She commanded longer than normal. When she stopped, the deacon's wife broke into a wide grin and began to wave her arm and praise the Lord. She was completely healed. Another significant healing was the healing a a pastor's wife. Her eyes were painful and that even spread to the forehead. The eyes would regularly tear up and flow down her cheeks. I had some sisters laying hands on her eyes. Within one command, the pain was gone immediately and the eyes stop tearing. Today, we had lunch with her and her husband, Pastor Juan and they testified to that fact that God had miraculously healed her last night. A young lady had strange pain symptoms in her abdomen and back. The doctors could not diagnose the source of the problem. 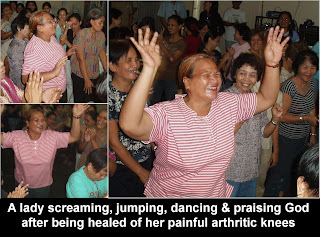 Last night, after the disciples took authority, she was completely healed. Another young lady had painful sores in her mouth and pain on her left side. Without me laying hands, the disciples did miracles. 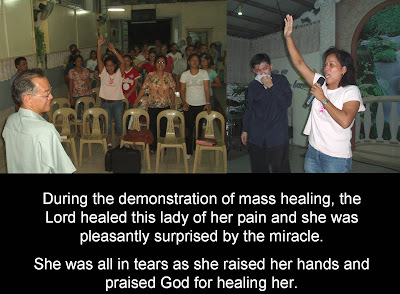 She was healed completely. After the demonstration, the people clapped profusely and later some came over and said that at first they were skeptical. However, the Lord showed that they could heal with the authority of Christ. One of the young pastors who jumped up when I initially invited people to lay hands was Pastor Esias Velma. He said that he came from a Baptist background but was also influenced by the Charismatics. He was skeptical about the teaching because he felt that he had no gift of healing. However, when the scripture was read and he realised that he had the authority, he quickly responded to my call for anyone who wanted to heal. Pastor Ruel is another young pastor who took over the church when his father, the former pastor, passed away suddenly last year. He was to held an Evangelistic Crusade next month and felt that he needed real power and anointing to do that. He prayed and prayed. Last night's session was the answer to his prayers because he never really expected such miracles could happen through his exercising of God's authority. Pastor Caesar and Pastor Anna are the pastors who loaned us their church building. They are also actively organizing this training meeting and rally with our branch pastor, Pastor Reggie. This couple is very active and they are leaders among the pastors in Bacoor and Cavite. 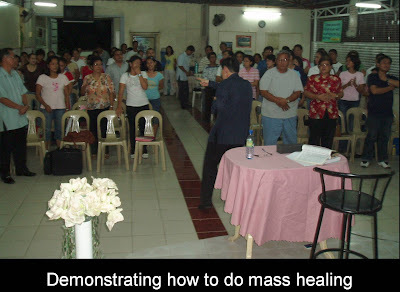 They would make good representatives and trainers of Elijah Challenge in the Philippines. We are inviting them to go with us up to Baguio to meet up with Pastor Carl Henderson. We trust that the message of Elijah Challenge will spread when more people encounter the power of healing. Tonight, I will be teaching mass healing and distance healing. Please pray for me because I was told that more people would be coming. This is very exciting. Grace and I can do this forever. The Elija h Challenge End-Time Model of Evangelism Today the Lord is restoring to the Church a Scriptural Model of Evangelism which will enable churches and believers to fulfill the Great Commission. In this model, based on John 14:12, "ordinary" disciples of Christ will preach the gospel and minister miraculous healing in low-budget, low-profile, relatively small (or even one-on-one) meetings. When the listeners see the miracles and hear the gospel, their hearts will be open to accepting Christ. The new believers will be followed up by the believing friend, family member, neighbor, or business associate who brought them to the meeting. Such personal follow-up of new believers will be more effective than the impersonal follow up after large mass crusades. There is a greater likelihood that the new believer will join the church and be discipled for Jesus Christ. 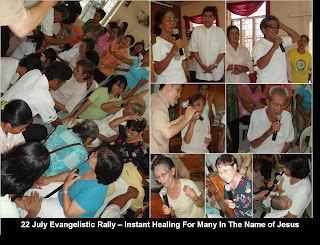 This kind of evangelism involving miraculous healings and the demonstration of the Spirit's power is through ordinary disciples and therefore not dependent on the presence of a specially gifted and anointed minister. As such, evangelism of this kind can be an ongoing and continuous feature of the life of every local church. This model of evangelism is not based on the charismatic gifts of the Holy Spirit but rather on principles gleaned from the ministry of Jesus Himself. Thus both Conservative Evangelicals as well as Charismatic Pentecostal believers are able to preach the gospel in this way and even work together in the spirit of unity. When every church is equipped with the End-Time Model of Evangelism, the Body of Christ will be significantly closer to the fulfillment of the Great Commission.